Seven kids at summer camp are unexpectedly transported by"digivices" to a colorful and enigmatic world. Lost and alone, they arebefriended by small digital monsters, Digimons. The kids and their Digimon partnersquickly become inseparable, and the little creatures guide their human friends through thewondrous DigiWorld, protecting them from the hordes of evil Digimons. The group soondiscovers that some of the giant Digimons they encounter are not evil Digimons but goodDigimons gone bad. A dark power is corrupting even the most gentle of Digimons byembedding Black Gears into them, turning them into vicious monsters. Creating chaos anddestruction wherever it goes, the evil power threatens all of DigiWorld. 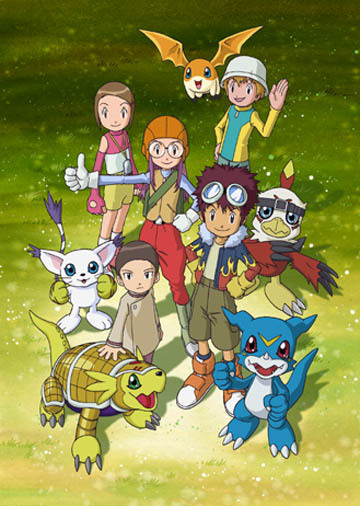 As they try tofind their way back home, the seven kids are drawn further and further into the mystery.Through teamwork and trust, they help their newfound Digimon friends digivolve from"monsters in training" to giant champions that must save the DigiWorld from thepowerful evil intent on destroying it. With an unbreakable bond between them, the kids andtheir Digimon companions embark on the adventure of a lifetime!